Looking for colored towels you can bleach without worry? Welcome to Towel Super Center, where we have a wide selection of bleach-safe colored towels that meet your budget and taste needs. Our bleach-safe colored towels are perfect for your salon, spa, fitness center, hotel or business — you can even order our towels in bulk quantities for your home! Browse our online catalog and find towels that are just right for you. If you’re in the business of beauty, there's a plethora of different tools and implements used throughout your day. The one most commonly utilized item is something that most people don’t immediately consider important: a towel! Choosing the best towel for your business, no matter what you do — nails, hair, makeup or all of the above — is crucial. The impact of deciding on the right towel for your business affects not only your financial bottom line but the “look” of your beauty biz. Depending on your specialty, these towels may have to be strong and resilient too. The ability to tolerate all sorts of harsh chemicals, such as bleach or acetone, is crucial. Wouldn’t it be wonderful if these amazingly tough towels were also soft, fluffy and easy on the eyes? The following tips about the various towel materials, classifications and mistakes business owners make regarding the correct care methods will help you buy and maintain the perfect towels for your hair salon or spa. Hair salons, nail salons and spas are only a few places that serve large groups of customers on a daily basis. All these businesses sell services that use a huge number of towels repeatedly for all sorts of reasons. 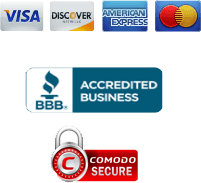 Dozens of clients per day can potentially come through your salon or spa. Can you imagine giving a customer a spotty, oddly colored towel to use on themselves? Not a very good business decision. 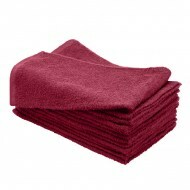 Finding a superior-quality towel that will endure hard washings and stain removing procedures is incredibly important. Towels become stained very easily as they're used in many ways at these salons. Towels can be off-colored or stained from hair dye, cleaning spills or just clients’ standard germs and sweat. All of these things need to be eradicated from the towels before you put them out to be used by more customers. The most simple and effective solvent or cleanser to use on them is bleach. Bleach, while ideal for removing stains and disinfecting these towels, can also make a mess of some fabrics and colors if said materials are not strong enough to tolerate it. Seeking out towels that are safe to bleach or bleach-resistant is important. Bleach-resistant towels come in a spectrum of different shades from Towel Super Center, which is ideal if you want to play with the color scheme of your business. With superior care, your bleach-resistant towels will be a smart investment, as they'll last for an impressively long time. Always look great: When you hand a towel to a salon client, you definitely don’t want to present a dirty-looking towel that’s streaked with hair dye or other mystery stains. Using bleach to wash salon towels is the best way to keep them looking fresh and enticing. Another interesting fact about bleach and towels: If you’re washing towels that are not bleach-resistant, the bleach will cause blotchy streaks, which look like stains. The towels will be ruined. Come in a spectrum of eye-catching shades: The old standby white, bleach-resistant towel is no longer a must. There's a rainbow of colors on the market — and they're bleach-resistant! They're made from pure cotton (100 percent) and a specialized dye that will not have a reaction to any bleach. Establishments that have to wash towels every day will find these ones useful and budget-friendly. Are available in an impressive range of sizes: Different businesses can use these towels in different ways. Hair salons can wrap a client’s hair while coloring or bleaching it without worrying about permanently ruining the towel. Estheticians who use smaller towels to help facilitate facials for dozens of clients can do so without worrying whether or not the towel has been properly cleaned, disinfected and rendered free of germs. Require a low level of maintenance: The care and maintenance of bleach-resistant towels could not be any easier than it already is. You don’t need to sort any colors because they're already bleach-resistant and will not bleed or run in the washer. Toss them into the washing machine, add in the bleach and detergent, and you're set. Bleach-resistant towels are a huge time saver because sorting is a thing of the past. There's no need to remember which towels cannot be washed with other sets of towels. Are budget-friendly: Bleach-resistant towels last a long time. 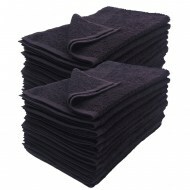 Costs are ultimately kept down because these towels are not thrown out as often as non-bleach-resistant towels. If you buy these towels in large quantities at one time with certain providers like Towel Super Center, prices per towel will drop even lower! Last a long time: Paying a higher price for bleach-resistant towels is comparable to making a smart investment. It's worth the slightly higher cost per towel. 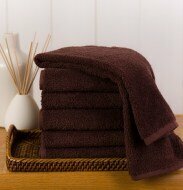 These towels are composed of pure cotton, which gives them their longevity. Seek out towels that are manufactured with lock-stitch hems, as they have added durability and can tolerate constant hard wash and sanitizing cycles. Bleach-resistant: These towels can take many cycles of washing when bleach is used. The fabric won’t break down or collect odd stains. Colorfast: This term is a common one on laundering labels. It means that the coloring used in the towel won’t be removed in the wash. Other items in the wash are not at risk of being dyed a different color. Non-colorfast: This term means the color used in the fabric can easily bleed, usually in the washing machine. It can even mean that the color can rub off onto other fabrics. Bleeding and rubbing off on other fabrics can cause streaks, stains and discoloration. Sure, colorfast towels are a safer bet for color retention than non-colorfast towels, but bleach-resistant towels transcend them all. Bleach might not be safe for some colorfast towels, but bleach-resistant towels are made to withstand the rigors of the chemical. They've been tested with bleach and don't pick up stains and streaks when they're washed. If you have towels that are not labeled bleach-resistant or bleach-safe, take a few minutes to perform a simple test to see if they're bleach-resistant. Take a quarter cup of water mixed with one tablespoon of bleach, and choose a hidden, less conspicuous area of the towel — perhaps behind a laundry label. Pour a little bit of this solution in the hidden spot, then wait for one minute. After the minute is up, dab at the area with a white napkin or paper towel to see if any of the towel’s color rubs off on it. Additionally, check the towel to see if the solution has changed the color of the towel. This little test can reduce the risk of damaging a large number of your towels if they're non-colorfast. Stubborn stain removal: Cosmetics, hair dyes, keratin straightening chemicals and compounds are typically found everywhere in a salon — especially on towels! These towels can hold onto ugly stains, streaks and blotches if they're not cleaned the right way. Laundry detergent on its own will not remove these stains. Bleach cleanses deeply, right into the material of the towel, and will bring back their true color and cleanliness level. White towel maintenance: If your salon or spa uses only white towels, it's a fact that over time and several cycles of washing, these white towels can start to lose their brightness. Discoloration occurs because of the microscopic buildup of stains, dirt, bacteria and other griminess. Regular detergent on its own will not be strong enough to maintain your towels’ whiteness factor, but bleach will do everything needed to constantly hold onto that desired bright white. Substantial sanitizing: Towels are used in spa and salon settings for dozens of reasons. They're handled and used on a vast number of people. The removal of all bacteria, germs and chemicals from these used towels is vital to the success of a salon or spa. Bleach is an incredibly potent cleaner and disinfectant that will kill almost all types of germs that attempt to cling to any towel. Using bleach in your towels’ laundry cycles will put your mind at ease regarding cleanliness. Be sure all fabrics are bleach-resistant: Do not use bleach if you have colored towels that aren't labeled bleach-resistant. You'll risk ruining them and probably have to buy a whole new batch. Note the fabric of your towels. Fabrics that are considered safe for bleach are cotton, polyester, nylon and acrylic. Take a careful look at the laundry label. If there's a symbol of a black triangle that's crossed out, do not use bleach on the towel. If you see a symbol of a white triangle, it's fine to use bleach. Always dilute the bleach first: Don’t ruin your towels by pouring bleach all over them. Always dilute your bleach with water. The optimal way to use the chemical is to wait for the washing machine to fill up before adding the bleach for best results. If your salon has a modern washing machine model that comes equipped with a bleach dispenser, follow your washer’s user manual on how to properly dispense bleach for your laundry. The washing machine will add it at the appropriate time in the wash cycle. Use the correct amount of bleach: Never use more than the recommended amount in your laundry load. Adding more than the recommended amount of bleach, even to a really dirty load of towels, may hurt them as opposed to helping. Going over the right amount may cause a yellow stain, spotting or streaking. A regular-sized load of towels will need only half a cup of bleach. A large-sized load that's heavily soiled will need about one cup of bleach to two quarts of water. Water quality matters: Bleach will not cause a bad reaction if the water quality is off, but your towels may slowly start to appear dull and off-color if the quality of your water isn’t right. Iron and manganese can accumulate on towels and over time change the appearance of the towel’s color through repetitive laundry cycles. If you find that your water quality is hard, you might find it beneficial to look into a water filtration system. Even the best bleach-resistant towels start to look tired at some point. They may not be as effective and absorbent as they once were. Even so, there's no reason to worry. This issue is a common one for salon towels, especially since they go through several wash cycles every week. Laundry detergent and fabric softeners usually begin to accumulate on your towels’ fibers. This accumulation is the reason the towels begin to absorb less moisture than before. If you use fabric softener, be sure to use it less frequently, as the softener contributes to the buildup. 1. First, place all your towels in your washing machine. 2. Put a cup of vinegar in the machine as you normally would your laundry detergent. 4. When the cycle is complete, keep the towels in the washing machine, and add the baking soda the way you would use detergent. 5. Run the laundry machine again as you would a normal laundry cycle without detergent or fabric softener. 6. Dry as usual. Your towels should be super fluffy and brilliant. The search for a premium quality bleach-resistant towel for your salon or spa doesn't need to be a difficult one. There are numerous styles, colors and sizes available from Towel Super Center to brighten and beautify your salon and soothe your customers. If you invest in elegant, well-stitched towels, the wear and tear of dozens of wash cycles shouldn't be obvious if you follow the recommended care guidelines mentioned throughout this page. Salons and spas go through towels quickly — dozens per day and sometimes more. With bleach-safe colored towels from Towel Super Center, you can use your towels again and again, without worrying about unsightly stains. Our high-quality,value-priced bleach-proof towels withstand wash after wash, too. These long-lasting towels stand the test of time, whether you use them on your customers, or you need them for messy cleanups. Because you can buy our bleach-safe towels in bulk, you’ll spend less and suffer reduced replacement costs, too. Shop Towel Super Center to get colored towels you can bleach. They are safe to wash alongside plain white towels. Forget about separating lights and darks — just toss your bleach-safe color towels in the laundry with other must-wash items and save yourself hours of labor every week. You’ll also use less water and electricity, and that can save you money! Towel Super Center carries bleach-proof towels in numerous sizes and colors, making it easy to enhance your salon or spa decor. Buy a bleach-proof bath mat for your workstation and soak up unwanted moisture easily — and prevent dangerous slips and falls. 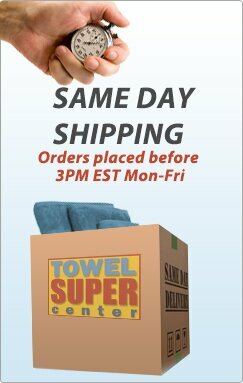 Order dozens of fingertip towels and hand towels in multiple sizes. You’ll find nearly every color you can imagine. Order towels in multiple colors and change the look and feel of your salon as the mood strikes you! At Towel Super Center, replacing your towels is easy and affordable. We know you need your bulk towel supplier to provide you with a wide selection and value for your money. When you order towels in bulk from Towel Super Center, you can choose between 16x26 hand towels in multiple colors and fabric blends, as well as generously sized 13 x 13 washcloths that are completely color safe. Our towels make it easy to keep gym or pool linens separate from bed and bath linens. Because you can bleach them without worry, your supplies will always be clean and in good condition! Where Can I Buy Bleach-Resistant Towels? At Towel Super Center, you’ll never have to sacrifice quality for the price. Our towels are manufactured to withstand multiple wash cycles, which means you can put off ordering more towels longer. We feel so strongly about the quality of our towels that you can even order towels by the dozen for your home — and never again worry that your guests won’t have enough linens to get through the day! From bed linens to towels for the bath or gym, Towel Super Center has the supplies you need at the prices you deserve. That’s why our customers include successful businesses such as hotels, fitness centers, nail and hair salons, car washes, golf courses and more. 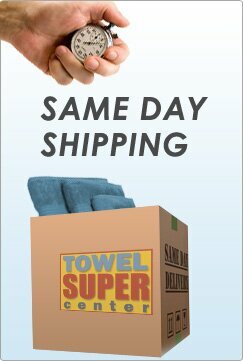 Towel Super Center makes it easy to get the towels you need with the quality and value you expect — and what could be easier or more convenient than that? Browse our online catalog and see why our huge selection of towels and linens in bulk makes us the online home of wholesale towels. Make us your one-stop shop for bleach-safe colored towels today!